St. Gall was born in Ireland and was one of St. Columban’s 12 disciples. He trained with St. Columban and St. Comgall and traveled with them to France to establish the Luxeuil Monastery between the years 585 and 590 A.D. In 610 A.D., St. Columban was exiled by leaders opposed to Christianity and the church and fled with St. Gall to Switzerland. In their travels they found the church alive and present, but many towns were without monasteries and cathedrals. Together they established monasteries where young Christian men could study and learn the scriptures. He died at the age of 95 in Switzerland, at Arbon. He spent the remaining years of his life in prayer and study of the scriptures. During his life in Switzerland, he lived on the Steinach River, and the monastery of St. Gall was erected on that site. The feast of St. Gall is celebrated on October 16th. Images of St. Gall typically represent him standing with a bear. A legend recorded in the Lives of St. Gall tells that one night as commanded by St. Gall, a wild bear brought wood to St. Gall and his traveling companions to feed a fire they had kindled in the desert. The history of St. Gall Catholic Church, School, and Parish is long. This history is compiled from the current church building Dedication book, the celebratory book of the Servants of the Holy Heart of Mary and 90th birthday of St. Gall, and the St. Gall 100th anniversary celebration book. Many thanks to Mrs. Janet Bohne and Mrs. Lil Hoffman for their help with this history. Beginning in the early 1840s, the area now known as Gage Park was originally settled by German farmers. While the decades and centuries have seen a change in demographics, Gage Park has always remained overwhelmingly Catholic. In 1865, the small cluster of farms and towns was incorporated into the town of Lake, and was officially annexed into Chicago in 1889. By then, farms were being replaced by some 30 wooden cottages, though there were no paved roads or public transportation system. In the early 1880s, the village of Elsdon, just to the west of Gage Park, was centered around the Grand Trunk Station at Fifty-First Street. The people depended on the Tiffany Car Shop for their work, and the small Catholic community living in the area became a mission and branch of St. Agnes Parish in the spring of 1890. Reverend J.A. Hemlock gave Masses in a small cottage located at 5151 S. St. Louis Ave. In the fall of 1893, Rev. Hemlock retired due to poor health and St. Agnes Parish welcomed Rev. A.J. Hitchcock. The “little mission” was well-served by this priest. Shortly after Rev. Hitchcock assumed the position at the mission, the church was moved to a larger space at 5201 S. St. Louis Ave. The Masses were held in a large hall upstairs while a grocery store occupied the first floor. Due to poor attendance at Mass, the Catholic congregation disbanded. Early in 1894, Father J.E. Le Sage from St. Joseph’s and St. Anne’s (both in Brighton Park) took control of the little mission. The church then moved to a frame house at the north-east corner of 52nd St. & Turner, now known as Christiana. Over the next five years, the community grew and the village of Elsdon became incorporated into the City of Chicago, just as Gage Park had been, and it became necessary to establish a permanent church and parish, rather than keeping the “little mission”. In May, 1899, Father Michael J. Sullivan was appointed the first pastor of the brand new parish. Father Sullivan served 132 parishioners, the first members of St. Gall. One parishioner, John A. Walther, suggested that the new church be named after the patron saint of his home canton in Switzerland. This suggestion was accepted by Chicago Archbishop Feehan, and thus St. Gall became the newest parish on Chicago’s southwest side. A large building boom was taking place as electric trolley service was extended first to Western Avenue, then to Kedzie. Beginning in 1905, Western & Garfield Boulevards were planned and laid out, contributing greatly to the development of industry and residences in the neighborhood. Shortly after this, the neighborhood was named for the Gage family, who owned much of the property in the area. Between 1910 and 1930, Gage Park was privileged to become home to a portion of the “bungalow belt”. These distinct homes & apartment buildings have housed generations of St. Gall graduates, and continue to be a source of pride in both Gage Park & the city of Chicago. Thanks to the building boom, St. Gall saw a tremendous growth in both adults and children, which contributed greatly to the building of our school. In 1908, after nearly 10 years in service to the people at St. Gall, Father Sullivan was transferred to Resurrection parish. In his absence, the Augustinian Fathers took charge of the parish as a mission of St. Rita parish. At this point in time a much larger church building was needed, and the church moved again, this time to a fourth building at 54th & Millard. This building sat more than 500 parishioners each Sunday. Mass was celebrated in the new building for the first time on May 1st, 1910. It was at this time that the parishioners felt the need for a school. In September 1910, the first classes were held at St. Gall School, located above the church at 54th & Millard. The first Sisters to serve the people and children of St. Gall were the Dominican Sisters from Adrian, Michigan. The first school was divided into two classes: first class and second class. The first class was comprised of first, second, third, and fourth grade, taught in one classroom by one sister, and the fifth, sixth, seventh, and eighth grades were taught in another classroom by another sister. For the first seven years of the school’s existence, the school was taught by Sister Adalbert, Sister Helen Marie, Sister Ann Genevieve, Sister Mary Theresa, Sister Mary Louis, and Sister Mary Wenceslaus. These nuns shared the convent with the Sisters at St. Rita parish and travelled each day via switch engine, driven by Mr. Art Foster, a St. Gall parishioner. On October 29th 1916, Father Fred P. Cannell was appointed pastor at St. Gall and the church building at 54th & Millard was abandoned for a better site at 55th and Kedzie. The school continued to meet upstairs in the building at 54th & Millard. By 1920, there were over 13,000 residents of Gage Park, mostly from Bohemian and Polish origins. Many of these residents found employment in the Chicago Union Stockyards. By 1925, the community was able to support 3 movie houses, including the Colony, which was built at 5824 S. Kedzie, and where it still stands today, though it is no longer used as a movie house. In 1922, Ben F. Bohac founded Talman Home Federal Savings and Loan, which originally stood on the corner of 51st & Talman, and was later moved to the corner of 55th and Kedzie, just across the street from St. Gall. The bank and St. Gall Parish enjoyed a working partnership for many years, which continues to this day (though Talman has since merged with LaSalle/Bank of America). In 1923, plans were drawn up for a new school building and the school was completed in 1924. The new school stood on the corner of 55th and Sawyer. The Dominican Sisters then remained at St. Rita and the Servants of the Holy Heart of Mary moved in to take charge of the school and serve the people of St. Gall. On September 22nd, 1923, the new school building opened under the care of Mother St. Agnes, Sister Mary Catherine, Sister Philomena, and Sister Mary of the Rosary. Approximately 100 children were registered on that first day. The Sisters moved into the Rectory, and Father Cannell moved in with a parishioner until a Convent could be built. While plans for a new church were created, the basement of the school was used for weekly Mass. A small convent was built at 5553 S. Sawyer and served the Sisters for only a few years. In 1926, the present Rectory was built to provide a new home for the priests. In June 1928, plans were drawn up for a new church in the school basement as the congregation swelled to more than 900 at Mass each week. On February 3rd, 1929, the new basement church was opened. In early 1924, Father Cannell resigned due to failing health. His replacement was Monsignor Hishen, who would serve St. Gall for more than 30 years. It was under Msgr. Hishen that St. Gall parish saw the greatest growth, both in parish numbers and spiritual development. The school was also marked by great growth and it was necessary to build an addition to the school. A second building of eight rooms was added in 1935. Five of these rooms were reserved and converted into living quarters for the twelve sisters who taught in the school buildings. Also at that time many social clubs were created by the parish members. Bowling leagues for men and women, a dramatic society, and a club for adolescent parishioners were all founded. The annual card party and dance was first held at this time. The annual party was the social and financial backbone of the parish for many years. As school enrollment increased, the Sisters found it necessary to convert the five classrooms in the new building back into classrooms and move into more private quarters. This would give the sisters more privacy as well as free up five classrooms in the school. In 1949, the present day convent was built. In 1949, the first St. Gall School Band was organized under Mr. Otto Nagl. For many years, the St. Gall Band was one of the most rivaled school bands on Chicago’s south side, at one time boasting over 100 members and marching in all our local parades, including the 63rd Street Christmas Parade. Mr. Nagl served St. Gall School as band director for nearly 40 years, and his legacy lives on in our music program. In the early 1950s, Monsignor Hishen noted that the basement church was once again unable to hold the crowds that attended Masses each Sunday. Masses were being held in what is now the school gym and Bingo Hall. Plans for an “upper church” or street level facility, were considered, especially because the basement church would flood during rainy weather. The first plans for the new church called for a superstructure over the old church so the new church could be built over an existing foundation. A fund raising committee was formed and was served by more than 20 men, including Mr. George Hoffman, whose wife Lil taught 3rd grade at St. Gall for more than 30 years. On October 16th, 1955, Monsignor Hishen broke the ground for the new church building. The first Mass celebrated in the present church on the corner of 55th and Kedzie was Easter Vigil, 1957. The seating capacity of the original church design was to be 1400. It was at the time of the new church construction that the present “middle addition” was added to the school. This middle addition joined the two school buildings standing a block apart on Sawyer and Kedzie. It included adding 4 new classrooms and a school library. Monsignor Hishen desired that the altar be the focus of the new church. He stated, “The altar should be the true center of the church.” Keeping these thoughts in mind, the original church drawings were scrapped and the architects created a new plan: a quarter circle, which shortened the distance between the furthest pew and the altar, as well as increased seating capacity, and keeps the altar as the focus of the church. The new design also made the best use of the space existing on 55th and Kedzie. The brand new church was formally dedicated on April 13th, 1958. As Monsignor Hishen entered retirement, he remained active in parish life. The convent basement was remodelled and named the Hishen Senior Center in 1972. That room had served as the parish Kindergarten for many years and was also home to our Extended Day program. It is currently the home base for the parish youth group that meets weekly. Monsignor Hishen passed away on May 25th, 1973 at age 79. His dedication to the people of St. Gall will always be remembered. The Hishen Center remains a vital piece of St. Gall parish. 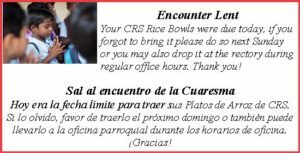 In addition to the youth group, it is now a gathering place for RICA, Religious Education, and English as a Second Language classes. In September 1989, the Servants of the Holy Heart of Mary celebrated their 100th anniversary at St. Gall, and St. Gall celebrated 90 years on the southwest side. They also celebrated their long cooperation together. That mass was celebrated with the people by Joseph Cardinal Bernadin, one of Chicago’s most beloved religious figures. Father David P. Dowdle was installed at St. Gall’s seventh pastor on October 16th, 1992. It was under Father Dowdle’s guidance the Hispanic Ministry began in order to reach out to the growing Hispanic population of Gage Park. The first Spanish-language Mass was celebrated on December 12th, 1996. More than 2,500 people attended the Mass. 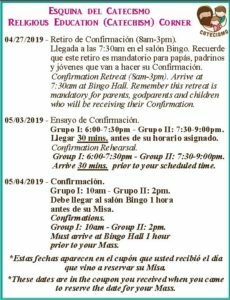 It was at this time that two Spanish language Masses were added to the weekend rotation to serve the growing Hispanic population. School enrollment has ebbed and flowed over the years due to increased population and the closing of other local schools. When the first permanent school building opened, St. Gall welcomed 100 children into the fold. At the time the new church was dedicated, school enrollment was over 1,000. When the parish celebrated it’s 75th anniversary in 1974, enrollment was 618 students. In the year 2010, our enrollment was 231. In the 1980s and 1990s, St. Gall School began to move into the Information Age. A classroom was converted into a Computer Lab, and the school was wired for Internet access. The after school Computer Club was transformed into a computer class, and each student attends class once to twice a week. Today, each classroom has at least one desktop computer, and all students have Internet access. St. Gall School also has wireless Internet. Most classrooms have a “white board” or interactive technology board, as well as an LED projector, which can be used in conjunction with a classroom laptop. As our world becomes more connected, St. Gall School recognizes that our graduates must be prepared to interact with the new and changing technology they will be exposed to. Beginning in 2001, work was done on the school to improve the building and thus enhance the education the students received. The old windows were replaced with windows that are heat efficient and soundproof. Our proximity to Midway Airport is an asset, but our soundproof windows allow education to continue without the interruption of sound pollution from the airport. With the addition of the windows, brand new air conditioning and heating systems were installed in each classroom. Ceiling fans were also added to keep the rooms from becoming too hot. The new windows are also equipped with emergency exits. Finally, brand new counter tops and cabinets were added to each classroom. The Computer Lab was also updated in 2004 to provide our students with the best possible opportunities. Our lab currently houses 35 computer stations, an interactive white board, headphones, a photo/document scanner, two printers, and the Internet and wireless servers for the entire school. In the 1990s a classroom was converted into a functioning Science Lab. Students receive practical experience performing experiments in biology, the life sciences, and chemistry. As the demand grew, a Preschool program was added in the mid-1990s and Kindergarten became a full day program. Each program introduces children to a Catholic education from a young age, and both programs allow students to become members of the St. Gall family from the very beginning. Father Gary Graf was installed as the 9th pastor of St. Gall on January 24th, 2010. It is the hope that the ministry begun by the previous pastors, sisters, ministers, and parishioners will continue well into the next 100 years. As we look to the future, it is the hope and prayer of all who work and serve at St. Gall that the parish and school continue to thrive and do the work of God here on earth. While many generations have come and gone from St. Gall, we know that as the people of God gathered together, St. Gall is our home.